Presentation Summary: This research based presentation addresses the important issue of lessening and eliminating stressful sound and noise in the clinical setting. How stressful sound/noise affects health and wellness of clients and residents will be discussed as well as how stressful sound/noise affects staff and our facility. Ultimately, strategies will be discussed and suggested on how to decrease and eliminate stressful sound/noise through awareness, positive change and creativity. INSTRUCTIONAL METHOD: Lecture with power point slides. 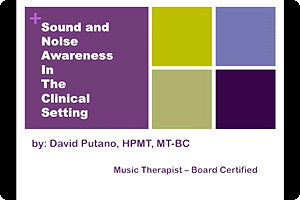 "Sound and Noise Awareness in the Clinical Setting." MOTIVATOR, POSITIVE DIVERSION FROM EXERTION, PACE SETTER, ETC.